French President Emmanuel Macron's alleged plan to hold a referendum is unlikely to dispel tensions, since the French are increasingly sceptical about Paris' incentives, Ramin Mazaheri, chief correspondent in Paris for Iran's PressTV, told Sputnik, explaining why the initiative may deteriorate the crisis. Citing unnamed high-ranking sources, French weekly Journal du Dimanche (JDD) reported on 3 February that Macron is considering calling a referendum on 26 May, which would coincide with the European parliamentary elections. According to the media outlet, the questionnaire is likely to address some economic and social issues including, in particular, whether the number of French lawmakers should be reduced or their terms shortened. "I think that unless [Emmanuel] Macron puts some real issues on the ballot — issues which the French people actually care about, issues which will immediately improve the socio-economic condition of the average French household — then the referendum idea will totally backfire, as many are predicting", Ramin Mazaheri, chief correspondent in Paris for Iran's PressTV, told Sputnik. Commenting on topics allegedly included in the list, the journalist noted that it seems that "this will not touch austerity, this will not affect anyone's purchasing power, and this is, in fact, quite a neoliberal idea, because it is a way to reduce the size of France's government. "So, we see that Macron is actually trying to use the referendum to push his own neoliberal agenda. He is not talking about ideas which the average Frenchman cares about, so that's really a totally tone-deaf move", he said. 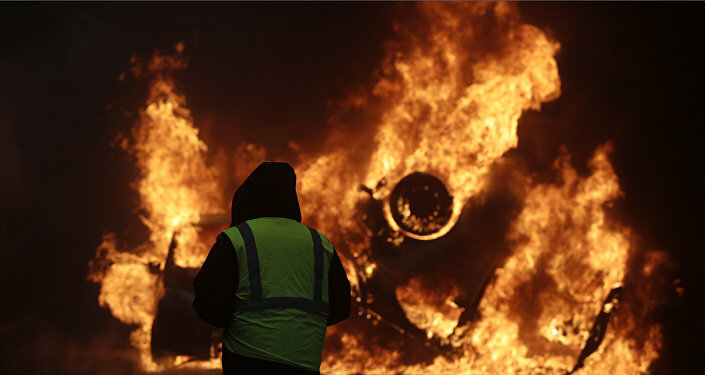 The journalist believes that what really matters for the yellow vests is whether the French president will resign anytime soon; however, Macron is unlikely to include this issue in the list, he highlighted. According to Mazaheri, the yellow vests want to address the issue of the French president's "sweeping reforms, all of which are designed to put France more in line with the US, British and German systems — and what's on the docket for this year are major right-wing rollbacks to the unemployment system and the social security system". Currently, the people of France have no tool to stop Macron "from doing whatever he wants" as he controls parliament and may literally "force changes through executive orders" while avoiding "public discussions of his unpopular reforms", the journalist noted. "So, it really comes down to what is going to be on the referendum — right now, it's looking like Macron is trying to co-opt the idea to push his own agenda while also gaining a way to refute the long-standing criticism that his governing style is fundamentally anti-democratic", he suggested. Will Macron Change His Mind and Political Course? It is unclear whether the referendum could prove successful in calming down the yellow vests protests, as it totally depends on the content of the referendum, the journalist opined. However, judging from what is being circulated in the media, the initiative may "backfire" on the French president, he said. "Is Macron going to have a total change of heart and political direction — is he going to all of a sudden start caring what the French people think?" Mazaheri asked rhetorically. "Macron's idea for a two-month 'National Debate' was another way to cut down on the protests, but it has either not worked or worked only marginally". He believes that "the reason is that people are very sceptical regarding Macron's interest in learning from public opinion, much less implementing it into policy". According to Mazaheri, the protests have somewhat waned due to Macron's "massive repression" as well as "some burnout, some slackening of activity" after three months of demonstrations. However, "even though the overall protest numbers are down, the hard-core Yellow Vests remain more organised and committed than ever, and we see that because of what is going to take place tomorrow, which is a broadening of the Yellow Vest movement", he pointed out. "A referendum on reducing the size of government — a classic neoliberal demand — is not going to help Macron at all", the journalist believes. "Macron needs to realize the fundamental weakness of his position", he stressed. "Only 25 percent of French voters chose Macron in 2017 for his personality or his policies, all the rest voted to block Marine Le Pen. That means that Macron has never had anything close to majority support, and his approval ratings have remained more-or-less around that same 25 percent because all he ever had was that core base". The yellow vests protests have long gone beyond France's borders, sending shockwaves across Europe. Furthermore, it has spilled over into other continents, exposing longstanding financial and social problems of the global economy. In December 2018, yellow vests demonstrations erupted in western parts of Canada over the country's waning oil market. Like their French counterparts, the Canadian yellow vests are up in arms about federal carbon taxes as well as halted pipeline projects. Speaking to Sputnik, Jeremy Rutar, a member of the Canadian yellow vests movement, bemoaned the fact that the country's economic policy is actually contributing to the impoverishment of the working class. "I think the Canadians are becoming aware of the hypocrisy of these imposed policies", he said. "We are shutting down coal-fired power plants… but selling coal overseas. We are being told [that] leaving Canadian oil in the ground is the best way to save the planet". Rutar underscored that the Canadian yellow vests "are waking up to the realization that this tax is doing nothing more but transferring what little prosperity is left in the working-class of our country, to the elite", which is "furthering the gap between rich and poor". "I mean taxing people to heat their homes in Canada. Edmonton, AB, Canada is further north on the longitudinal plane than Moscow. We see temperatures below —40 Celsius. To tax people like this on a necessity is predatory", he said, referring to the domino effect it has had on food costs: groceries, transportation of goods, and farming in any sense. 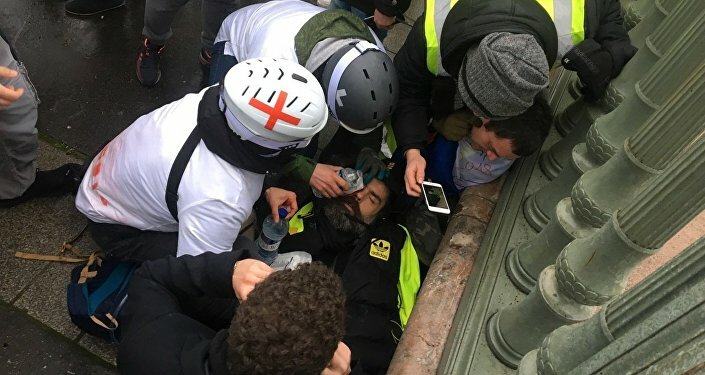 According to the protester, the yellow vests movement "is a realization that, that the Global Compact and all globalism is, and has been the scourge of humanity since its inception".